On this transfer deadline day R's fans finally had reason to be excited as we would actually be involved for the first time in many years. The first signing, albeit approaching 11pm on this deadline day, is Shaun Wright-Phillips! Wright Phillips joins for a fee believed to be around the £6.5 million region and has signed a 3 year deal. The 29 year old found himself surplus to requirements during his second spell at Eastlands and has opted to head back to West London and pull on the blue and white hoops and turn down offers from Stoke, Bolton and Wigan. Wright-Phillips will be looking to rejuvinate his career in W12 and try and force his way into Fabio Capello's thoughts ahead of the Euro 2012 Championships next summer. "I'm delighted - I can't wait to kick-start my QPR career," Wright-Phillips said. "Once I spoke to the Manager and saw the direction that the Club was going in, I wanted to be a part of that. "I'm here now. Get behind me as best as you can, just like the City fans did, and I'll give you a hundred and ten per-cent every time I go on to the pitch. "It's exciting times for QPR. With the new signings and the squad that we've got, the Club is heading in the right direction." This is yet another fantastic addition to the R's and shows the ambition we have as a club and continue to not only settle for survival but to reach safety with a lot more comfort. 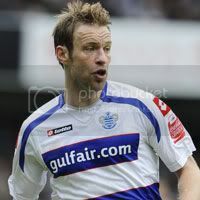 Welcome to QPR Shaun! We hope you have a successful time whilst you are here in W12! Finally after waiting the weekend for his signature, Armand Traore becomes the R's latest summer signing. The 21 year old left back penned a 3 year deal at Rangers this lunchtime. Traore was made to wait for the move due to Arsenal being down to their bare bones at Old Trafford and was on the wrong end of the 8-2 battering to Man United. Traore seemed to keep himself out of harms way and didn't do anything to jeopardise his move to West London. Its safe to say that he would eight two be an Arsenal player for any longer than he would have to be. Excuse the poor joke! Traore began his career in the youth ranks at Racing Paris and Monaco before moving to Arsenal in 2005 and going on to sign a professional contract in 2006. In his five year spell playing for Arsenal he wasn't given much game time and only managed to make 13 goalless appearances. In 2008 he was loaned out to Portsmouth to gain first team experience where he made 19 appearances playing as left midfielder, scoring his only Premier League goal against Sunderland. In 2010 he was once again loaned out but this time to Italian side Juventus for the season where he spent the majority of his time on the bench, subsequently only making 10 appearances in his time there. Traore has been capped by France at U19 and U21 level before making a single appearance for his native Senegal in 2011. "When I talked to Neil Warnock he was very passionate about what I could bring to the Club. "He was very motivated about playing me week in, week out, and that's what I need at this stage of my career. "I've not been able to prove and show what I'm all about because I've been at two big, big Clubs like Juventus and Arsenal. "I'm looking forward to coming here and playing regular football. "The ambition of the new owners and the calibre of players they are signing is something that really attracted me to the Club." Traore will wear the number 13 shirt. Welcome to QPR Armand, we wish you every success in the famous blue and white hoops!! Today the R's fans made the 200+ mile journey to Wigan in the early hours of the morning hoping that the positive news of the signings of Joey Barton and Luke Young would help inspire the R's to a win ahead of the two week International break. The Lofty Heights gang made the trip to the DW Stadium. Once again we were in two cars with myself driving Jess, Sam and Luke and Lofty took to the wheel with PK and Steve as his passengers. Lofty's journey started extremely early as he had to travel from Hemel down to Burnham and then head north to Wigan. In my car we had a slightly longer lay in, till 6.15, before taking to the road. In a highly uneventful journey (not counting Sam's bout of morning sickness on the side of the M6) we then pulled off the M6 to the inevitablilty of a few clangers being dropped. Firstly upon seeing the sign for Wigan Pier Luke immediately asked if we were near the coast which cracked everyone up. The second one to make everyone laugh was my apparent excitement of seeing an Asda and a Sainsbury's in the same retail park, in my line of work its rare to see so I did get slightly more carried away than I should've, this prompted the gang to goad me for the duration of the journey (luckily it was short) every time we passed a supermarket, gits! We all arrived in Wigan just 15 minutes apart at 10.30 ish and parked at the Red Robin pub only to find that it was not due to open until 11am, so we made our way over to the Frankie and Benny's joint just opposite. During our time in Frankies we all had a good catch up and everyone was feeling very positive about the game. We were even treated to some Spanish lessons everytime we went to the toilet, if anything I think it made us all want to go in there more often than we usually would! 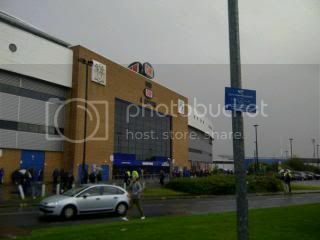 Come 12:00 we all made the short walk over to the DW Stadium and got pretty wet in the process. When we got inside the stadium we queued up for what seemed to be a lifetime for our drink and sample of the famous Wigan pies, that in all fairness weren't all that they were hyped up to be, we then made our way to our seats just in time to see the teams emerge from the tunnel. Only one change was made to the side that won at Everton last weekend. Bradley Orr sat out through injury and was replaced by Bruno Perone. This meant the R's defence was make shift with all four being central defenders. This meant that Danny Gabbidon played at right back, Bruno Perone and Fitz Hall paired up in the centre and Matt Connolly took up his role at left back. With the virus still rife in the squad, DJ Campbell once again didn't travel and Jay Bothroyd stayed on the bench as he still isn't 100% fit. Starting 11 :- Kenny, Derry, Hall, Gabbidon, Taarabt, Faurlin, Buzsaky, Perone, Connolly, Agyemang, Smith. The game got off to a pretty lively start and was fairly level even though it was Wigan that were creating the more threatening attacks. Emerson Boyce strolled from right back all the way through the R's defence until he reached the edge of the penalty area before laying the ball off to Victor Moses who took aim from six yards out you thought that the deadlock was about to be opened, luckily for us his shot (or was it a cross?) evaded everybody in the box and ended up nearly going out for a throw in. Straight from that the R's broke away and Derry found himself 25 yards out with the goal at his mercy. The evergreen midfielder unleashed a fantastic drive and Ali Al-Habsi in the Wigan goal had to be at full stretch to deny Derry his first QPR goal. The R's seemed to grow in confidence from this and just a few minutes later came even closer. Buzsaky fed Taarabt the ball on the left edge of the penalty area as we looked at it and the R's captain curled a sublime effort that seemed to be curling in at the far post, all the travelling R's thought it was in, but it cannoned off the post only for Agyemang to pick up the rebound and promptly pass it back to Al-Habsi. Rangers came close again when a corner was only cleared as far as Buzsaky and his cross found Perone at the back post, but the Brazilian could only put his header into row Z and another chance went begging. The R's were made to pay for their missed oppurtunities on 41 minutes. Figueroa passed to Di Santo on the edge of the R's penalty area while the R's appeared to back off and invite Wigan to attack. Di Santo hit a decent shot towards goal that took a slight deflection and spun into the top corner of Paddy Kenny's goal. A well taken goal but the deflection definitely wrong-footed the R's goalkeeper. Just before the half time whistle Taarabt had a free kick from 35 yards out. He decided to take it Ronaldo styli and hit it as hard as he could with a toepunt. 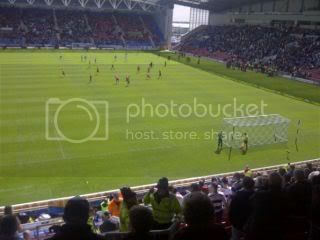 The free kick took a wicked deflection and Al-Habsi scrambled across his goal line to tip the free kick onto the post before Wigan cleared their lines. We may of been 1-0 down at half time but the sprits in the camp were still high. We should have gone in level and definitely played well enough to be going in at 0-0. You can rue the chances and having hit the post twice its fair to say that we were unlucky to be losing. It was more of the same again in the second half with the R's pressing Wigan but also with Wigan hitting us on the counter attack with Rodallega and Moses. On 61 minutes the R's make shift back line were dealt with another blow with Fitz Hall being forced off through injury and was replaced by Michael Harriman who was making his Premier League debut. This meant Harriman moving to right back and Danny Gabbidon reverting to his more familiar role of centre back alongside Bruno Perone. Just five minutes later the R's were dealt with an even bigger blow. Rangers relinquished possession far too easily and Di Santo found himself in possession 25 yards out and took aim, unfortunately for Bruno Perone the shot flicked up off the end of his boot and found the top corner of Kenny's goal once again. Two goals, two deflections, too harsh on Rangers. Shortly after the goal Jay Bothroyd come on for Akos Buzsaky. Bothroyd's introduction gave the R's more attacking impetus and made us look a lot more threatening, in fact Bothroyd done more in two minutes than Agyemang had done for the previous 70! The R's last notable chance went to Perone. His header cannoned off the Wigan bar and out to safety. It was then that you just knew it wasn't going to be our day! Bruno Andrade came on for the final eight minutes in the place of Tommy Smith. Andrade looked to be a real livewire down the left wing and looks to be one to look at for the future. Andrade was unlucky not to be able to claim an assist on his Premier League debut when his mazy run resulted in him sliding a great ball across the Wigan six yard box but no R's striker was on hand to tap into an empty net. The scoreline was harsh on us today. Two deflected goals, we hit the woodwork on three separate occasions and had to play a weakened side due to the virus still lingering in the club. Perone looks to be well out of his depth in my opinion and looked to be a rabbit in headlights a lot of the time. His team mates did all they could to help him along the way but that only got him so far. For me Taarabt just doesn't look comfortable in the Premier League at the moment. Every time he ran at the Wigan defence in the first half he just ran into a defender and lost possesion. He appears to be getting knocked off the ball far too easily and is seriously lacking match fitness. Faurlin also seems to be looking a shadow of the player that we saw in the Championship last season too. I think he's fallen over more times than he has successfully passed to a team mate this season. Having said that he did seem to improve in the final 15 minutes but he really need to improve the physical side to his game asap. On to Man of the Match and there are plenty of positives for this. The gang were split with this today and it just goes to show how we all viewed the performance. Steve voted for Shaun Derry and another great battling display. Jess and PK opted for Tommy Smith and his energetic performance. Lofty opted for Matt Connolly who put in another good show when being played out of position again. The winner however with three votes from me, Luke and Sam is Danny Gabbidon. Gabbidon played extremely well at right back and when switching to centre back he looked extremely comfortable. He didn't put a foot wrong and read the game very well today. Wigan Athletic: Al Habsi, Caldwell, Watson, Di Santo (Sammon 68), Moses (McArthur 68), Gomez (Stam 86), Boyce, Rodallega, Diame, Lopez, Figueroa. Subs: Kirkland, McCarthy, Thomas, Jones. QPR: Kenny, Derry, Hall (Harriman 61), Gabbidon, Taarabt, Faurlin, Buzsaky (Bothroyd 72), Perone, Connolly, Agyemang, Smith (Andrade 80). Subs: Murphy, Helguson, Ephraim, Hewitt. After the game we made our way back to the cars and got very wet once again! It's just typical that we travel up north with the weather looking good at home but as soon as you go north of Birmingham the weather is always grey and miserable. Its safe to say we were all very glad to get away from Wigan and get home in time to relax with a curry in front of the tv at a decent hour! The second new signing of the Fernandes/Bhatia era has been announced and its yet another former England International, Luke Young. Young joins the R's from Aston Villa for a fee believed to be rising up to £2 million. Luke Young started his career at Spurs in 1997 and made his name as a full back but never managed to hold down a regular first team slot. He made 58 appearances before moving to Charlton for £4 million in 2001. 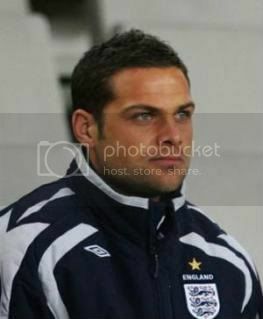 Young was very popular at the Addicks and established himself as one of the best right backs in the country. In 2005 Young won the first of 7 England caps. In 2007 following Charlton's relegation from the Premiership Young moved to pastures new and to one of the most northern clubs, Middlesbrough. Young cost Boro £2.5 million and signed a four year contract. However after just a season in the North-East, Young was on the move again, this time to Aston Villa for a fee rising up to £6 million and signing a three year deal in 2008. Young has made 73 appearances for Villa but fell out of favour under Martin O'Neill and in 2010 Liverpool and Villa agreed a £2.5 million fee but Young turned the move down stating that he had more chance playing for Villa and would only be a back up for the Scousers. "I am ready for a new challenge," he said. "There are big things that are going to happen at this Football Club and I am really pleased to be a part of it. "Myself and Joey signing here shows the intent of the Club. Young brings a wealth of experience and will be yet another fantastic addition to the squad and further strengthen our back line. To be able to sign a player of this calibre just shows the ambition that the new regime have and really want to establish ourselves as a Premier League club and bringing in these types of players makes the start of this journey even more exciting! Welcome to QPR Luke, we wish you every success during your time here at Loftus Road. This afternoon QPR have announced that the R's have bagged their first big name in the Fernandes/Bhatia era as we unveiled Joey Barton as the newest addition to the R's revolution. Barton joins on a four year deal and with no fee being paid to Newcastle, this really could be the bargain of the season! Barton, often surrounded by controversy, has not had the quiestest of careers its safe to say and his off-field antics have often hit the headlines for all the wrong reasons but there is no doubting the ability of the man. Had he stayed clear of trouble previously then its safe to say that Barton could've been a multi capped England International as he is a sensational player when all that is put aside. 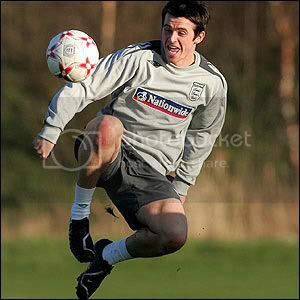 The most entertaining moment of the charismatic midfielder is during the time of his England call up which was just after he openly critisised the 2006 England teams failure and as he sat down for breakfast on his first meeting Frank Lampard got up and moved elsewhere, Barton's response was pure genius "I'm not going to steal your breakfast you fat prick", just say it how it is Joey, I like that style! What I am personally looking forward to is having Barton in a team with Adel Taarabt and Joey trying to tell Adel that he's done wrong. Could it be a potential for another on field brawl between team mates or will Joey provide Adel the kick up the backside that Taarabt sometimes needs? All I know is that the leadership and battling qualities being brought into the club by Barton will be a massive positive for this club. "It's been quite a whirlwind, so to get things finally sorted and draw a line under it all is a great relief. "The ambition of the Club really impressed me. "There's obviously a great set of lads here already and that's why they had such a great season in the Championship. "The gaffer is talking about adding two or three more bodies and that, combined with the potential of the Club and the new owners' ambitions, bodes really well for the future." Bringing Barton in really does signal our intentions to not only survive in the Premier League but to also go on and establish ourselves in the top flight for many years to come. Barton will wear the number 17 shirt. Welcome Joey, we hope you provide much inspiration and have a very successful time in the Blue and White Hoops! On to a more downbeat note. On Wednesday Kaspars Gorkss swapped the Blue and White Hoops for the blue lines on a white t-shirt and joined Reading for an undisclosed fee. Gorkss has been a fantastic servant to this football club since his 250k move from Blackpool three years ago. Gorkss was undoubtedly the best back up we had for the first choice partnership of Fitz Hall and Danny Gabbidon so why was he sold? Was it to balance the books? Was it because we've tied down Shittu and Ramage to year long contracts on decent wages under the previous regime and now we need to balance up the wages? All I know is that if we do get an injury to either Hall or Gabbidon then we currently only have Matt Connolly that is capable of taking their place and beyond that we would struggle. Tuesday nights performance against Rochdale showed that Perone and Shittu are not up to scratch and would need vast improvement if they are to stand a chance against any Premier League strikers. Its sad to see Kaspars go but we wish him well and hopefully soon he will get the crack at the top flight that he deserves, I just hope its not with Reading! The curse of a Cup Competition struck again at Loftus Road, as Rochdale ran out 2-0 winners in the Carling Cup this evening against an under strength, but more than capable, QPR. With the R's now in the Premier League, we were spared the agony of the First Round this year, with tha agony being delayed slightly for the second round. Like most of the early rounds, they are hardly a big draw, attendance wise and myself, Jenson and California Hoop were all that were there from the troops tonight, for one reason or the other. But I have to say, the ones that stayed away made a VERY wise decision. With a low attendance expected, our normal seats in the Upper Loft were not available tonight, so we were shifted over to the South Africa Road stand for an uncomfortable first half - and that doesn't mean what was going on on the pitch! Anyone near or over 6ft tall is going to struggle in this stand and I spent the first half with my knees firmy wedged into the seat in front of me. When the half time whistle blew, I stood up and let the blood start to re-circulate back into my lower legs and feet and we decided to move to the sparcely populated lower loft for a bit more comfort - and after managing to sweet talk a very understanding steward, we were kindly let through the gate and into a stand with much more leg room. QPR: Murphy, Orr (Harriman 31), Taarabt, Bothroyd, Perone, Connolly, Ephraim, Shittu, Andrade, Cook (Hewitt 73), Rowlands (Derry 71). Subs: Cerny, Buzsaky, Gibbons, German. Man of the Match - it was unanimous between the three of us - the very kind steward that let us pass into the Lower Loft at half time, takes tonights vote. To summarise, I must first give Rochdale the credit they deserve for their win. They were bang up for the challenge and took their goals very well - the second being a delightful chip from Gary Jones. We wish you all the very best in the next round and all the best of luck for the rest of the season. But this was so disappointing in so many ways from a QPR perspective. It is blatantly obvious, with 8 team changes from Saturday, that the Premier League is the priority this season - and rightly so. But Rangers just didn't look at all interested and this game seemed to be used as a run out for a good few of the players and nothing more. In my opinion, the line up was stronger than anticipated and more than capable of beating Rochdale, with all due respect of course. Lee Cook and Martin Rowlands were extremely poor and I expected better from two players that you think would be out to prove a point. It must also be mentioned of just how unfit and out of shape Lee Cook looked. Bruno Andrade was the one shining light for me personally tonight. Anyway, come Saturday I am sure this will all be forgotten about as we travel ridculously early to Wigan. Lofty Heights will be well represented at the game once more and Lee will return with what will no doubt be another unique away report. Today the R's faithful hit the road for their first Premiership away game in 15 years and hoping to put in a good performance on the back of last weeks defeat against Bolton. As always the Lofty Heights gang were in attendance. The gang were travelling in two cars today as there were so many of us were attending this fixture. In one car was me, Jess, Sam and Luke and in the second car was Jenson, Lofty, PK, Jo, Smithy and an Everton fan. The journey was very smooth for both parties and we both arrived in Liverpool just 20 minutes apart. We all met at the entrance of the Bullens Road Stand where we were due to be taking our seat and all had a good catch up on the street discussing the past few days at Rangers'. Its fair to say we all have renewed optimism now that Tony Fernandes has bought out the poison dwarf and the man from the you've been tango'ed adverts, to join forces with the Mittal family and Amit Bhatia returning to boardroom level. One rumour we did hear outside the ground was that in the near future an announcement will be made in regards to the Club Crest. 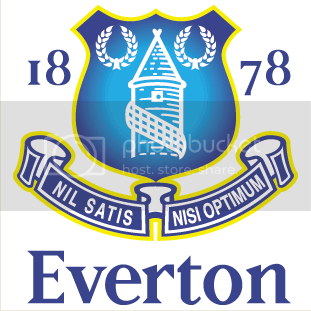 Apparently we will be reverting back to the old crest. One of the reasons behind this is because the majority shareholders want rid of anything that represents the former majority partnership so that we can begin the new era with a fresh, clear approach that has the fans and the communication to the fans a lot clear and not the smoke and mirrors approach of old. All of the gang entered the ground at about 2 but myself and Jess had to hang around outside until Iceman arrived as we had his ticket for the game and also for next weeks game at Wigan. Whilst we were waited for him we bumped into Michael and Debbie before Jack then walked by with his family members. Finally at 2.30 Iceman arrived so we could get an reunite with the gang before kick off. Lorna had arrived and was already with the gang before we all met up and took our place in our seats. As we were waiting for Iceman the team news broke, all we saw was that Jay Bothroyd and DJ Campbell weren't in the starting line up, the latter not even on the bench. It wasn't until I saw a tweet from Amit Bhatia saying "gonna be v diff day, some bug hit the camp - DJ hasn't travelled, Jay sick, Adel sick but starting, Matty C sick but we need him. OUCH!!" Explaining why we were starting with just Patrick Agyemang up front. Starting 11 - Kenny; Orr, Hall, Gabbidon, Connolly; Derry, Faurlin; Buzsaky, Taarabt, Smith; Agyemang. Rangers started off looking to impress and put together the passing football that made them such a force in the Championship last season. Within five minutes we had our first chance. Connolly and Taarabt combined down the left side before Connolly crossed for Tommy Smith in the centre and he side-footed his effort just past the left hand post. Even though we were the away side we were finding our feet and growing in confidence and putting together string of great passing football before Taarabt got fouled on the edge of the Everton box. Taarabt dusted himself down and swing in a wicked free kick that curled just wide of Tim Howard's goal. Everton began to work their way back into the game and were awarded a soft free kick just outside the R's box. Leighton Baines stepped up and curled his free kick over the wall and onto the bar before Rangers cleared their lines. Minutes later and we had the opening goal. After great passing, coupled with a great interception from Shaun Derry, Buzsaky found himself in possession and fed Tommy Smith the ball just inside the Everton box, he turned and had enough time to pick his spot and curl the ball around Tim Howard and into the bottom right corner. Cue jubilant and wild celebrations by us all in the away end!!! 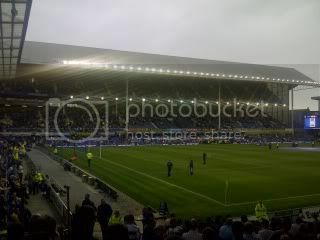 For the remainder of the half Everton tried turning the screw and put more pressure on the R's defence. On 40 minutes Everton had by far their best chance of the game. Beckford crossed to the back post to Cahill who was unmarked and he somehow missed the target from three yards out. When the half time whistle blew you can easily say that the 2,000+ travelling fans were extremely happy with the slender lead that in all fairness we deserved for all the hard work, movement and fantastic passing that we were putting together. Fitz Hall and Danny Gabbidon were immense at the heart of the defence whilst Shaun Derry was putting in a determined and gritty performance as he guarded the space just in front of the back four. Everton must have had a bit of a talking to before they came out for the second half as they came out all fired up and had the first chance of the half. Rodwell found space down the Rangers' left and his shot was safely gathered by Paddy Kenny. On the hour mark Agyemang looked as if he landed heavily when challenging for a header and he was down getting treatment for five minutes before being stretched off to a warm applause from the R's fans and a minority of the Everton fans booed him as he was taken off. The ill Jay Bothroyd replaced him. Everton fans were getting restless and 10 minutes into the half David Moyes tried playing his first trump card as he took Jack Rodwell off and Mikel Arteta replaced him. Everton continued to pile on the pressure and the resilience of the R's defence as well as Shaun Derry marshaling the rearguard and making challenges all over the pitch. Rangers still looked to break but they were spending large parts of the remainder of the game in their own half. When Louis Saha came on with 15 minutes to go you just hoped that time would fly by and hope that the final whistle would hurry up and arrive! When the board went up with the injury time on it we found out we had five more minutes to hold on, FIVE! What a fantastic few days for everyone at the R's this week! The Tony Fernandes/Mittal era began on Thursday and just two days later we go to Everton with a squad badly affected by illness and we go and fight our way to a 1-0 victory, it just does not get any better! Some of the football we played in the first half was fantastic and if we continue to knock the ball around in that manner and then get a few bodies in the box to cause defenses more problems then we will fair really well this year. The names being linked to the club are very exciting and this really is a great time to be a QPR fan. Man of the Match today was a unanimous decison. There were brilliant performances from Danny Gabbidon, Fitz Hall and Akos Buzsaky(considering he's not played 90 minutes for quite some time). However our decision went to the charismatic, battling and evergreen Shaun Derry for his determined display, putting his foot in on everything and working tirelessly through the game. Everton: Howard, Baines, Heitinga (Saha 74), Jagielka, Distin, Beckford (Fellaini 64), Cahill, Neville, Barkley, Osman, Rodwell (Arteta 55). Subs: Mucha, Hibbert, Vellios, Anichebe. QPR: Kenny, Orr, Derry, Hall, Gabbidon, Taarabt, Faurlin, Buzsaky, Connolly, Agyemang (Bothroyd 57), Smith (Ephraim 66). Subs: Murphy, Gorkss, Perone, Vaagan Moen, Andrade. On our way home in the car, Jess marked the predictions across the leagues made by Luke, Lofty, PK, Jenson, Jo and myself. It was a close contest but Luke marked his first prediction win as he won on 27points, PK and myself shared 2nd place on 25points, Jo came fourth with 23 points, Jenson 5th on 22 points and Lofty picked up the wooden spoon (usually owned by Jenson) with 17points. The gang all arrived safely home at 8.40 and all in time to enjoy our performance on Match of the Day. This afternoon the fantastic news broke that Tony Fernandes has bought out Bernie Ecclestone and Flavio Briatore and start a new era in the clubs history. At 2pm the press conference was broadcast live on Sky Sports News. 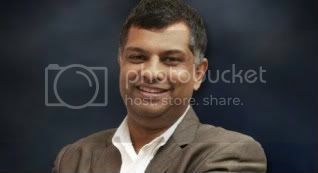 Amit Bhatia introduced himself and Tony Fernandes, stating that Fernandes had now bought out Bernie and Flavio to attain a 66% majority shareholding in the club. Tony Fernandes will be taking up the role of Chairman of the club, replacing Gianni Paladini in the role and effectively ending the Italian's eight year involvement with the club. The Mittal family retain their 33% holding in the club and Amit Bhatia will be resuming the Vice Chairman that he left at the end of last season. Bhatia resigned from the role due to disagreements over the release of Ishan Saksena as QPR Chairman and the decisions made over season ticket pricing. Even though Bhatia left the role he still had the support of the R's faithful as we hoped that the Mittal family would oust the former regime. The Fernandes and Mittal partnership will be joined by Phil Beard of the Anschutz Entertainment Company (subject to Premier League approval) and he will bring vital business experience into the club as we look to continue to grow as a club and progress to bigger and better things. Beard was an instrumental part of helping the successful bid for the London 2012 Olympics, transferring the Millennium Dome into to multipurpose arena and helped to turn it into the O2 Arena. Beard was also part of the management team that created the Air Miles loyalty programme. Its safe to say that there are exciting times ahead for the R's! Tony Fernandes and Amit Bhatia wasted no time at all in stating that manager Neil Warnock has the full backing of the shareholders and that they would provide the manager with what he wants as the ambition this year is to stay in the Premier League before progressing on to higher heights. Fernandes described QPR as "a raw diamond that he hopes to contribute to turning it into a diamond". As well as supporting the manager in the transfer market, Fernandes has longer term plans ahead for the R's. He wants to improve training facilities and also develop our academy so that we can bring through more of our own players and give the fans a team that they can be proud of. Finally Amit Bhatia concluded by stating that he and Fernandes will be discussing ticket prices in the near future and an announcement will be made in due course. 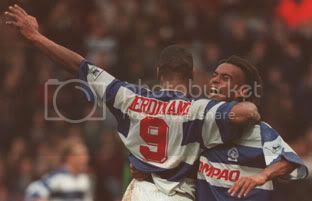 Fernandes grow up on the Uxbridge Road and the first live game he attended was at Loftus Road so his surroundings are very familiar and he will very quickly feel at home at QPR. Welcome aboard Tony and welcome back Amit!! We look forward to enjoying your successful partnership and will enjoy the journey we are about to embark on with you. On Saturday the R's fans hit the road in the Premier League for the first time in 15 years. The destination of this momentous occasion is Everton. Will the R's bounce back from last weeks unfortunate 4-0 loss against Bolton or will Everton benefit from starting the season a week later. Here are some club details and hints and tips for you on your visit to Goodison Park. 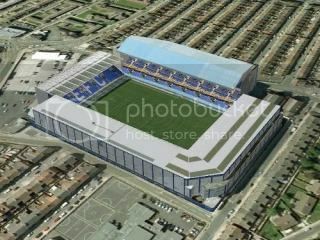 The away end the R's will be housed in is the Bullens Road Stand. This is split into two areas, the Paddock which has the best view of the two. This can hold 1,700 fans. 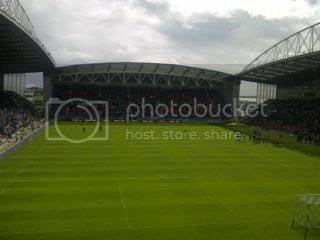 Then you also have the Upper Tier which can house a further 1,300 fans but this is restricted view! If you are near the back of this stand then you will have two supporting pillars to contend with and could get quite frustrating. The seating in the Upper Tier is also very dated and there are basic facilities available to the travelling fans. Supporters in the Paddock will enjoy a much better view of the game and will also have newer seats to perch themselves on. Just a side note; if you do notice flowers lying around the perimeter of the pitch, this is because the ashes of a number of supporters (over 800) have been interred around it. This is the first meeting between the clubs since the R's were relegated in 1996. The game at Goodison Park that season ended in a 2-0 victory for the Toffees courtesy of goals from Graham Stuart and Paul Rideout. The R's last victory at Everton was on 20th November 1993. It was a 3-0 victory for all to enjoy. I couldn't find out the goalscorers for that day unfortunately. By Car :- The post code being used for todays journey is L4 4EL. From the South follow the M40 until you reach the M42 and then join the M6. Carry on up the M6 until you reach the junction for the M62 (junction 21A). Follow the M62 until you reach the end of the motorway (beware of a 50mph speed camera about a 1/4 of a mile from the end of the motorway). Then follow the A5058 towards Liverpool. After three miles turn left at the traffic lights into Utting Avenue. Proceed for one mile and then turn right at the corner of Stanley Park into Priory Road. Goodison is at the end of this road. If you arrive early then there is street parking to be found around Walton Lane. Otherwise park over towards Anfield or in Stanley Park itself. The entrance to the car park which costs £8, is in Priory Road. By Train :- Kirkdale station is the closest to the ground(just under a mile away). However, it may be advisable to go to Sandhills station as this has the benefit of a bus service to the ground, which runs for a couple of hours before the game and around 50 minutes after the final whistle. 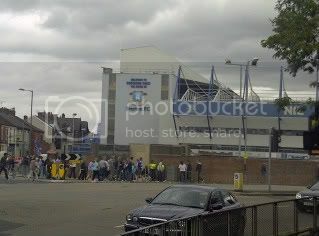 The bus will drop you off within walking distance of Goodison. Both Sandhills and Kirkdale stations can be reached by first getting a train from Liverpool Lime Street to Liverpool Central and then changing there for Kirkdale. The main railway station in Liverpool is Lime Street which is over three miles from the ground, although it is mostly downhill on the way back to the station, so either jump on a train to Kirkdale station or jump in a taxi, which will cost about £6. There are an array of pubs to choose to visit. There is the Thomas Frost on Walton Road. This is a Wetherspoons and will host both home and away fans. The pub close to Lime Street Station called the Head of Steam, this is also a Wetherspoons and will play a good host for travelling R's supporters. There are plenty of pubs around the City Centre to choose from so take a wander and enjoy the sights of Liverpool. Around the City Centre you will find many food outlets to choose from so find your favorite restaurant/take-away shop and fill yourself up. Catering inside the ground includes amongst other things; a Scouse Pie £2.30, Steak Pie £2.50, Cheese and Onion Pie £2.30, plus Sausage Rolls £2.30. They also offer a huge meat pie for £3. I first bumped into Jenson who, suited up, was spending the day in an Executive Box and was making an early challenge to Corporate Gordon's crown. The scores will be level next week as Gordon will be sampling the Corporate Hospitality at Goodison Park. Also in attendance were Tony and Dad, Mick and at this point, I, along with all of us at Lofty Heights, would like to Congratulate Tony and Wife, Mel, on the birth of their gorgeous baby daughter, Jessica Jane!! I took a slow walk then to the Spingbok pub and to my delight, saw R's fans outside drinking in the lunchtime sunshine. The delight was shortlived as as soon as I arrived, the doorman was shuffling people in as the 1pm, drinking in the street curfew had arrived and I soon found myself inside what was an absolute sweatbox. After a very rushed pint, I sat outside, drinkless, but much more comfortable with Sophie, Mick and Tony and slowly but surely, the rest of the gang duly arrived. Onto the game and the two teams took the field and Rangers were finally parading the brand new home shirt of thinner and more traditional blue and white hoops. New signings, Kieron Dyer, Jay Bothroyd, Danny Gabbidon and DJ Campbell were all making their QPR debuts. We almost made the perfect start when on 2 minutes, Taarabt's cross was flicked on by Bothroyd, for DJ Campbell to prod home from close range, only for the goal to be ruled out by the offside flag. More disappointment followed five minutes later when Kieron Dyer, probably the most unluckiest man in football, went down awkwardly after a tackle and was stretchered off, with a suspected broken metatarsal. Later X-Rays have proved in fact there is no break so we wish Kieron, who has worked tirelessly pre-season, a very speedy recovery!! Despite the setback, Rangers pressed hard and had much the better of the first half, with Bothroyd seeing a header cleared off the line. There were further chances for Smith and Taarabt but the R's were caught with the classic sucker punch, five minutes before the break - Arsenal target, Gary Cahill collected the ball 25 yards out and curled a superb effort into the top corner. Bolton had demonstrated with style, that you need to take your chances in the Premier League. The Trotters started the second half the brighter and Klasnic forced a fine save from Paddy Kenny before Kevin Davies headed just wide. Rangers replied and Adel Taarabt curled an effort just wide. But on 67 minutes, Bolton doubled their lead - Chris Eagles free kick was turned into his own net by Danny Gabbidon, who had been having a fine debut for the R's. It all went a bit flat from here as the players all looked very down and a section of the R's support starting directing their frustrations at Flavio Briatore. Three minutes later, it was 3-0 as Klasnic's deflected effort beat Paddy Kenny and Muamba made it four with ten minutes remaining giving Bolton a somewhat flattering scoreline it has to be said, but on their second half performance, a deserved victory all the same. More abuse was aimed at Flavio Briatore and rightly so, when, after the fourth goal, he and his entourage made for the exit. Not the sort of behaviour you would expect from the owner of the Club, especially with potential investor, Tony Fernandes sitting beside him. And just to rub salt into the open wounds, Clint Hill was sent off in stoppage time for allegedly, headbutting Petrov. By all accounts, it was nothing of the sort but nevertheless, stupid of Hill to get so involved so late in the game. QPR: Kenny, Hill, Derry, Hall, Gabbidon, Taarabt (Buzsaky 72), Dyer (Orr 7), Campbell, Bothroyd, Faurlin, Smith (Helguson 72). Subs: Murphy, Connolly, Agyemang, Ephraim. Man of the Match - was divided amongst the gang with Shaun Derry, Fitz Hall and Danny Gabbidon all in the running. But today's award, with 3 votes amongst us, goes to Jay Bothroyd. 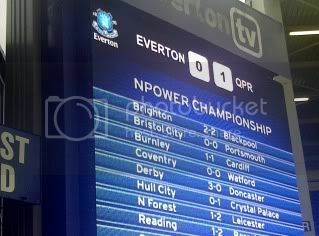 In summary, anyone looking at this result will think it was a thumping and QPR are surefire favourites for the drop. But in all honesty, I am not overly disappointed and I enjoyed the match immensly, really, I did. 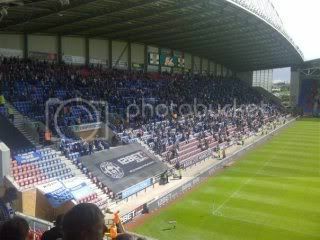 For an hour we were as good as Bolton and more than held our own. But a moment of quality and two fortunate goals made it an extremely difficult afternoon. 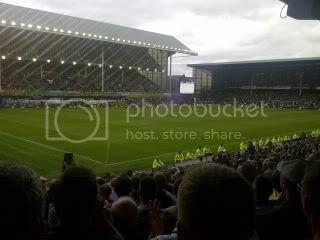 The Lofty Heights gang are in strong force and on the road to Everton next Saturday and Lee will return with one of his legendary away reports, from Goodison Park. This is your last chance to compete in the Lofty Heights Fantasy Football League. Simply register a team on www.fantasy.premierleague.com and then select to join the Lofty Heights league, just enter the code 62681-23735 when prompted and see if you can become the 2011/12 champion. Having successfully got past the First Round of the League Cup this week, we drew our attention to tonight's Second Round draw. 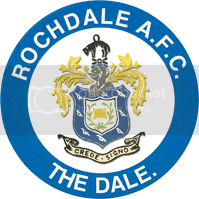 The R's were the last team out of the bowl and were given a home tie against Rochdale. The game will take place on the week commencing 22nd August. 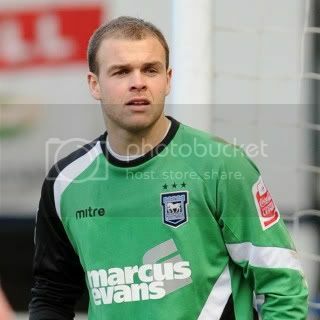 This morning the club announced the signing of former Ipswich goalkeeper Brian Murphy on a free transfer. The 28 year old has put pen to paper on a two year deal that will see him provide competition for Radek Cerny and current R's number 1 Paddy Kenny. Murphy joined the club on trial during the clubs tour of Cornwall and impressed enough to be given the nod to travel to Italy and try to further impress the R's hierarchy and in the final of the Trofeo Bortolotti and saved the final two spot kicks to secure yet more silverware for the R's, this time on European territory against Atalanta and SG Braga. Murphy started his career at Manchester City in 2000 yet made no first team appearances in his three year spell at the club. Murphy was drafted out on loan to Oldham and Peterborough in 2003 yet only made one appearance for the latter. In 2003 Murphy moved to Swansea and in his three years there he only managed to get 13 appearances before he moved back to his native Ireland and Bohemians in 2007. In 2008 Murphy was named the Irish Goalkeeper of the year and in the summer of 2010 he moved back to England and to Championship side Ipswich Town having made 97 appearances for Bohemians between 2007-2009. Murphy made 20 appearances for Ipswich last year and decided not to extend his stay and pursue a move elsewhere and that's where we stepped in. "It is great to be here. I am really looking forward to the new season and working with the goalkeepers. "Since I have been here I have enjoyed it, and I think I have done okay. The Manager and the coaching staff seem pleased so I am just delighted to have my future sorted out. "I am here to work hard, and anything extra will be a bonus. I want to be in that 18-man squad every week, but I know every player here wants the same thing. "It is going to be a massive season for the Club and one that I am looking forward to being a part of." Welcome To QPR Brian, we hope you enjoy your stay here! 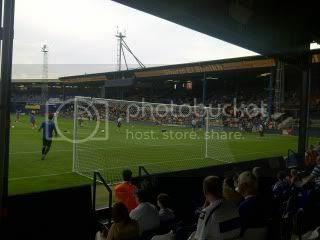 Tonight the R's travelled to Luton Town to play the final pre-season friendly ahead of the brand new Barclays Premier League season. The journey started off when I travelled to pick Jess up in sunny Caterham and proceeded to hit the M25 at 3.30 as we looked to avoid the rush hour traffic. Just 15 minutes into the trip we found ourselves diverting off the M25 due to major delays and we hit the back roads in hope that we could save ourselves a lot of time by avoiding everything. After over two hours weaving around Reigate, Dorking, Guildford, Woking, Staines, Windsor, Slough, Beaconsfield, Amersham and Rickmansworth we finally re-joined the M25 to see nice clear roads to be able to put our foot down to try and arrive with a decent amount of time to spare so we could find a good parking space. Shortly after reaching Hemel Hempstead and having a quick pit-stop, we were contacted by Lofty and Jo G informing us of the traffic that lay ahead and gave us directions to an ideal parking space that was cleverly being reserved by Lofty until we arrived. Shortly after 7 the 4members of the travelling party were united and made the way to the ground via someones front door and climbing through a bedroom window to access the seating area of the stadium. Neil Warnock named probably his strongest starting 11, which included yesterday's new signing DJ Campbell. Kieron Dyer started in an unorthodox right back position as Warnock looked to experiment in the last opportunity he had. Kenny; Dyer, Hall, Gabbidon, Hill; Derry, Faurlin; Smith, Taarabt, Campbell; Bothroyd. Subs:- Cerny, Orr, Connolly, Perone, Ephraim, Buzsaky, Vaagen Moen, Doughty, Andrade, Helguson, Agyemang, Hewitt. The R's got off to the best possible start, scoring in the opening 29 seconds. Taarabt's cross was poorly dealt with by the Luton defence as DJ Campbell found himself free inside the 18 yard box and superbly finished to bag his first goal in a QPR shirt. Rangers' were soon on the back foot and if it wasn't for a superb sliding block by Gabbidon and a brilliant reflex save from Kenny then the R's could have been pegged back quite quickly. Luton were enjoying large amounts of possession and the R's defending was holding up to the challenge but if Luton's shooting in front of goal was a lot more accurate then it could have been a different story. Gabbidon looked good in the heart of the R's defence, putting in many great challenges and blocks when it was needed. He seemed to read the game very well and sniffed out a lot of decent looking Luton attacks. Bothroyd and Smith had some half decent chances to double the R's lead but both men saw their efforts flash just past the post. Taarabt had the R's final chance of the half when his free kick from 25yards out stung the palms of Tyler in the Luton goal and when behind for a corner. In terms of how the team played in the first half I would say that when we went forward we looked dangerous but we did give away possession very cheaply and defensively we did look shaky at times. However what I would say is that we had four new squad members on show in the first half and they will need time to gel. What worried me the most is that Taarabt was supposed to be playing down the left side and left Clint Hill exposed on too many occasions. My personal opinion is that we cant play two strikers as well as Taarabt, if he plays then we can only afford to play with one of Bothroyd or Campbell and I can't see much point on having one of our quality signings this summer sitting on bench. Nine changes were made during the interval as many of the fringe players and potential starters were given a chance to shine. Cerny; Orr, Perone, Connolly, Hill; Dyer, Buzsaky; Agyemang, Vaagen Moen, Ephraim; Helguson. Subs remaining :- Doughty, Andrade, Hewitt. The R's started the half much the better of the two sides and really got some crisp passing together. Dyer and Buzsaky looked excellent in the centre of midfield and looked as if they have forged a real understanding together. The R's were really threatening but if it wasn't for many poor first touches from Agyemang then we may have had even more opportunities to extend the lead on four or five occasions. Rangers' did have the ball in the back of the net on a second occasion through Heidar Helguson finishing off with a sweet drive from 18 yards but the offside flag was raised and it didn't count. Kieron Dyer, who was fantastic throughout the second half in midfield, was taken off on 72 minutes and was replaced by Michael Doughty. Two minutes after Dyer was taken off, Luton drew themselves level. Luton broke away down the left side and Morgan-Smith crossed for Barnes-Homer to head home from 6 yards out. 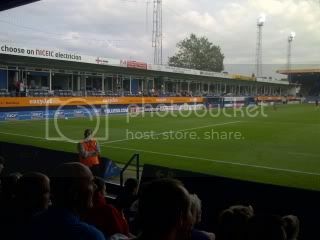 The Luton fans went crazy when they scored, anyone would have thought that they has won the FA Cup and not scored the equalizer in a pre-season friendly, was very funny from where I was standing. Two minutes later and Luton came close to adding a second. A swift breakaway saw Dance smash his effort on to the crossbar and how it stayed out I will never know. Rangers' made their last two changes of the evening when Hill and Helguson made way for Andrade and Hewitt. 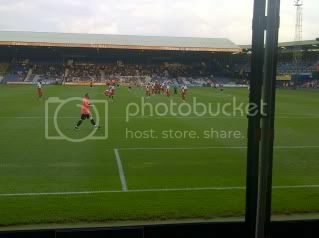 A minute after the substitution Luton put themselves in front. Morgan-Smith chased Orr's back pass to Cerny and Cerny's clearance hit Morgan-Smith before bouncing into the empty net. Five minutes later and Luton made sure of victory as Watkins shot took a deflection and found it's way into an empty net. By now the Luton fans were swinging their shirts above there head and getting ready to celebrate with a street party down the dingy roads that lead to Kenilworth Road. 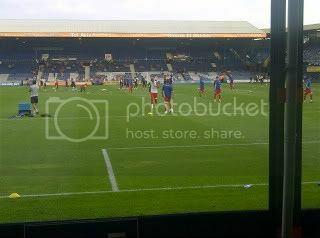 When the final whistle was blown the smug announcer said to everyone "Blue Square Premier Luton Town 3 Barclays Premier League QPR 1, I never realised pre-season friendlies meant so much to people these days. Next we'll find out that they are producing DVD's as a collectors item for the one and only time they beat Premier League opposition, in a friendly. Fair play to them though, they did look good in the final 15 minutes of the game. In summary, we had some positives to come out of the game. Firstly no-one was injured so we now have a full squad with a clean bill of health ready for Saturday's kick off. Secondly, Kieron Dyer in midfield tonight looked superb and we need to use him in a similar role if we are to get the best out of him. His class did show and he looks like a class act and if he stays fit we will benefit greatly from it. Coincidentally all three goals went in just after he came off. Thirdly, I look like like of Gabbidon, he reads the game well, has a fair amount pace and can be a great signing for us. He could however be prone to the odd mistake but I hope I am wrong. Lastly, the acquisition of DJ Campbell looks to be the perfect signing and is sure to become a real fans favorite almost instantly. All I'm hoping for is that we find a system that will work for us and that can accommodate our best players in and not leave us so vulnerable at the back. We do look good going forward but its the defensive side that gives me the most cause for concern. If we do sign Ryan Bertrand on loan from Chelsea and the possibility of Jason Puncheon and Jermaine Jenas coming to Loftus Road then we do have a good chance of putting up a good fight on our return to the Premiership. Luton Town: Tyler, Gleeson (Watkins 64), Osano, Keane, Beckwith, Antwi (Asafu-Adjaye 64), Lawless (Lacey 90), Dance, O'Connor (Morgan-Smith 72), Crow (Barnes-Homer 64), Howells (Poku 90). QPR: Kenny (Cerny 46), Dyer (Doughty 72), Hill (Andrade 82), Derry (Ephraim 46), Hall (Orr 46), Gabbidon (Trialist), Taarabt (Vaagan-Moen 46), Smith (Connolly 46), Campbell (Helguson 46) (Hewitt 82), Bothroyd (Agyemang 46), Faurlin (Buzsaky 46). Today QPR announced there first cash summer signing ahead of the start of the new season as DJ Campbell joins from Blackpool. The fee for the Hammersmith born striker is believed to be £1.25million, the release fee clause that was inserted into his contract when he joined Blackpool. Campbell started off his career as a youngster in the R's youth ranks before moving to the West Midlands to play for Aston Villa's youth team. He was not offered a professional contract at Villa and left to ply his trade in the lower echelons of English Football, with the first stop being at Chesham United. After a successful season there, scoring 16 goals in 29 games, DJ then moved on to Stevenage Borough. An unhappy time was endured there for two season and eventually Campbell moved on to Yeading. Campbell impressed during an FA Cup game against Newcastle United in front of the BBC cameras and this paved the way for a £5,000 move to Brentford in 2005. In January 2006 DJ was on the move back up to the West Midlands as Birmingham agreed to pay Brentford £500,000 for the strikers services. Campbell helped the Blues' achieve promotion back to the Premier Leaugue in 2007 and scored 9 goals in 43 goals for the club, this attracted he attention of Leicester and they in turn spent £1.6 million on the striker. Campbell struglled to hold down a regular starting position for Leicester and in 2009 he moved to Bloomfield road for the first of two loan periods at the Seasiders, the second one being in February 2010. On the 31st August 2010 Campbell became Blackpool's record signing, a £1.25 million fee was paid by the newly promoted Premier League team. 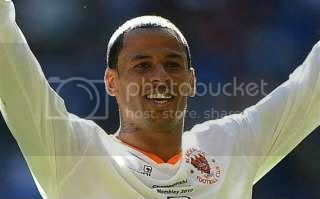 He scored 13 goals from 31 appearances last season, an impressive return considering Blackpool's defensive frailties. "It's a Club that I supported as a kid," an excited Campbell told www.qpr.co.uk. "I grew up around here and QPR have played a massive part in my life. "This was my first Club, from 6-16, so to finally be back here at the age of 29 is really special." He added: "It's a massive Club and it means a lot to me to be back here where it all began. "There were other Clubs in the Premier League that showed an interest but when I heard QPR were in for me it was an offer I couldn't refuse - this is my Club." What a great signing this will be for the R's! 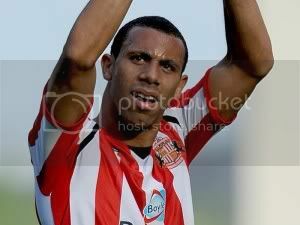 We hope you have a very successful time in the Hooped shirt DJ!!!! !